Hello Everyone, this post is going to be a little different from the informative posts I usually write because I am excited! Not long now and I am off on my next archaeological dig, this time to Turkey!!! Friends keep telling me to blog as I go so I guess I will, so welcome to a series of posts focused on my archaeological adventures in Turkey. My 7th international dig in the last 6 years. Post 1: Where on earth am I going this time!?! Truth be told I don’t know much about Turkey/Anatolia. My area of research is generally Greece but with the progression of my PhD into unknown realms, I’m taking the opportunity to go and partake in some research and data collection and at the same time increase my archaeological skills in Cilicia in Southern Turkey. I warn you, this post is going to be quite long so get your cup of tea now! So here is an opportunity for some preliminary research and to create a post on the ancient sites of Cilicia. The region of Cilicia is located in the southern part of Anatolia and was officially founded by Antiochis IV in the first century AD though it has a complex history before this time. Located on an active Mediterranean trade route, Cilicia is generally associated with its area of native rebellion and piracy. Cilician pirates particularly dominated between 133 and 67 BC when they were defeated by Pompey the Great. Pompey revolutionised warfare at this time by offering the pirates a peaceful chance to surrender and receive leniency. Cilicia is surrounded by a natural fortress provided by the Taurus Mountains to the North and East and the Mediterranean on the South with a coast full of ideal hiding places for pirates. Archaeological features in many areas include mooring, construction of buildings and shore access, stairs, defensive walls, fortresses, submerged columns, anchor remains and shipping jars, indicative of a coastal culture. Within Cilicia are two sub-regions known as Flat/Smooth Cilicia or Cilicia Pedias (the Eastern region), and Rough Cilicia or Cilicia Tracheia. Evidence from the 13th century BC indicates that the region was originally called Kedi/Kode before the fall of the Assyrian Empire in the 7th century BC when it became an independent region ruled by the Syennesis dynasty of kings and then being absorbed into the Persian Empire by Cyrus the Great. The pirate attacks in Cilicia appear to originally have been directed against Seleucid Kings involving slave and wine trade before they became more indiscriminate at the end of the 2nd century BC and defensive walls were built. Rome thus implemented an official ban of pirate interactions in 102-100 BC and created the Roman province of Cilicia to legitimise these laws. The general M.Antonius was commissioned to curb the pirate menace while the pirates allied themselves to the King of Pontus, Mithridates, to fight against Roman dominance. Eventually they were defeated by Pompey and Mithridates committed suicide in 63 BC. With this the Pontic kingdom also became a Roman province attached to Bithynia. The death of Julius Caesar saw some minor pirate wars in succeeding years but these were easily curbed. At one point Cilicia was gifted to Cleopatra VII by Anthony but with their deaths it was again split up and handed over in part to Antiochis IV of Commagene. While older tribes such as the Cetae, Lalasseis and Cennatae stayed settled in certain areas of Cilicia, Cilicia then became two Byzantine provinces; Cilicia Prima and Secunda. Iotape, also known as Aytap, is a port city about 30km east of Alanya. The first archaeological evidence for human settlement comes from the first century AD though there is a concensus that it was earlier inhabited by tribes. It was originally founded by Antiochis IV in 52AD after he took control of Cilicia. Antiochis named the city for his wife Iotapa and it became Iotape (η Ιωτάπη). The city is in an excellent place because of its natural harbour for trade and agriculture and its higher plateau where the settlement is protected from the sea and invasions from the coast. The natural harbour is made up of two bays measuring around 100m. Archaeological survey and excavation has uncovered ruins of an Acropolis with huge walls built around it to provide defense. Coins have been found indicating that Iotape included a mint which produced coins from the reign of Trajan to Valerian. There are also remains of Roman sewers, a necropolis and monumental tombs and sculptures, Roman baths, inscriptions and a rectangular Basilica to the East of the Acropolis. Temple ruins have also been excavated with surviving frescos within the city centre of the modern city. Selinus is now located in the area of modern Gazipasa and has settlement evidence from as far back as the Hittites in 2000 BC. Selinus was established on the River Kestros and is now called Hacimusa and was incorporated into Cilicia in 628 BC. It is located about 180 km to the East of Antalya on the Southern coast of Anatolia. Selinus became part of the Roman Empire in 197 BC and became particularly famous in the first century AD when the Emperor Trajan died there. As a consequence, for some time Selinus was known as Traianapolis. Selinus later became part of the Byzantine Empire alongside the rest of Cilicia before falling into the hands of the Turks in 1225 AD. It is listed among the castles of Gazipasa alongside Iotape, Lamus, Nephelis and Antiochia ad Cragum and is still subject to archaeological research by a team from Florida State University. The archaeological artefacts from Selinus are now mostly housed in the museum of Alanya. Anemurium is now the modern city of Anamur located at the most southern part of Anatolia closest to Cyprus. Archaeological evidence at the site reveals Roman occupation through the ruins of theatres, tombs and walls which are in part still visible today. The modern excavations at the site are being undertaken by the University of British Colombia though former excavations have been undertaken by the University of Toronto in the 1960s and by English Naval explorers in the 19th century. The tombs at Anemurium appear to date back to the 1st century AD until the Arab invasions of the 650s AD. In addition to the theatre complex, excavations have turned up an odeon and several bath complexes with Mosaic floors, four early Christian churches, a basilica and aqueducts. Numismatic evidence also shows that the city had a mint which produced coins from the first to the third centuries AD when it was eventually captured by the Sassanians. 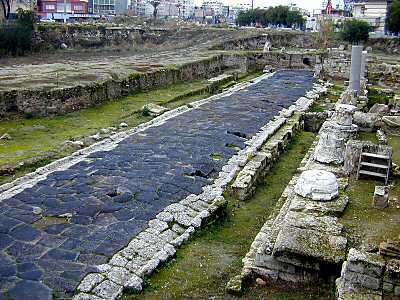 Tarsus is located inland from the Mediterranean by about 20km in the area of Cilicia. The city is located on a major trade route which increased its prosperity over its 2000 years of known historical contribution. It was an important point of intersection between the land and sea routes making it a significant place of commerce. At one point it was the accepted capital of Cilicia in the Roman Empire and held fame for being the meeting place of Anthony and Cleopatra as well as being the birthplace of Paul the Apostle. Excavations at Tarsus reveal that occupation dates back to the Neolithic period and continues throughout the Chalcolithic and Early Bronza Age. Excavations of the ancient city have been limited due to the placement of the modern city but much of the history of the city is known through literary accounts. Tarsus is mentioned in the campaigns of Esarhaddon and in the records of Shalmaneser I and Sennacherib. The foundation of the city itself is unclear but legends spring up in the Roman period and the geographer Strabo asserts that it was founded by explorers from Argos. At first it appears that Tarsus was ruled by the Hittites before falling into the hands of the Assyrians and the Persian Empire. It was a Persian satrapy from around 400 BC and is mentioned by Xenophon in his record of the march of Cyrus the Younger. The patron god of Tarsus was Sandon throughout the majority of its established history down to the third century AD. And further fame was accorded to Tarsus as it was affected by the passing through of Alexander the Great in 333 BC. Tarsus was also famed for its schools and a library which were said to rival Athens and Alexandria. Around this time Tarsus was also known as Antiochia on the Cydnus. When Pompey defeated the pirates in Cilicia, Tarsus became subject to Rome and took the name Juliopolis. Subsequent to this and the birth of Paul the Apostle, Tarsus held a long and prosperous ecclesiastical association and history. Claudiopolis, or Ninica as the area was formerly called, was a colony founded by Clausius Caesar and mentioned in Ammianus alongside Silifke in his list of the cities of Cilicia. It is located between the two Taurus mountains in the basin of the Calycadnus which was drained by the Calycadnus. Claudiopolis is often associated with the Calycadnus river’s Northern and Western branches and the passes over the mountains from Laranda. While Pliny and Ptolemy both mention cities by the names of Claudiopolis, only Ammianus’ reference refers definitely to the Claudiopolis of Cilicia. Not much else about Claudiopolis is known. Silifke is also known as Seleucia of Seleukeia and is located on the coast of Southern Anatolia on the banks of the Goksu River which flows from the Taurus mountains. It was founded by Seleucus I Nicator in the 3rd century BC as one of several cities he named after himself. Earlier occupation layers suggest that there was already a settlement on the site, possibly the twoens of Olbia and Hyria which were united under the establishment of Seleucia. The nearby settlement of Holmi was also incorporated into Seleucia in later years as Holmi became vulnerable to pirate attacks so that it was safer in incorporation. Seleucia rivalled Tarsus in commerce and trade. In the second century BC, the city became an important religious centre surrounding the temple of Jupiter. It received further fame as the site of famous schools of literature and philosophy and as the birthplaces of Athenaeus and Xenarchus. Later additions were added to the city by L.Octavius Memor in 77AD who constructed the stone bridge among other buildings and in 300 AD Seleucia became the capital of the Byzantine state of Isauria. Following this Seleucia was a prosperous area of Christianity and councils were held there by the early Christian bishopd in 325, 359 and 410 AD. It also is the resting place of the famous tomb of the virgin saint Thecla of Iconium who was converted by Saint Paul. The tomb was celebrated and restored many times over the years, most notably by the Emperor Zeno in the 5th century. Diocaesarea is the Roman name of the modern city of Uzuncaburç. Its history spans from the Seleucid period and the majority of the archaeology comes from the Roman peiord. Among the archaeology we find the ruins of the temple of Tyche dating to the reign of Vespasian or Domitian in the 1st century AD. The worship of Tyche though is thought to date back to the Seleucid period because Tyche was venerated in all the cities founded by Seleucus. Remains also remain of the city walls and gates which reveal inscriptional evidence indicating that the gate was erected at the end of the fourth century AD by the emperor Arcadius. The fortifications are believed to have been to cull the threat of mountain dwellers in Cilicia who were believed to be a permanent threat to Roman interests. Syedra is located near the modern town of Seki about 17km southeast of Coracesium. Ancient literature mentions it in Lucian in the first century BC after a phase of complex power struggles which placed Syedra in the province of Pamphylia in the time of Tiberius in the first century AD. Archaeological remains of Syedra include well preserved baths and a theatre, cisterns and city walls on the site of a rounded mountain top near the coast line. Archaeological evidence for a port at Syedra also exist dating far earlier to the Bronze age period. The monumental door still marks the the entrance to the Roman city of Syedra and painted frescos remain within carved niches in the stone of caves. One of these caves is famously known as a baptising cave. The bath building is located to the east of the town with mosaic floors and columned street remains can be found to the west of the bath complex. 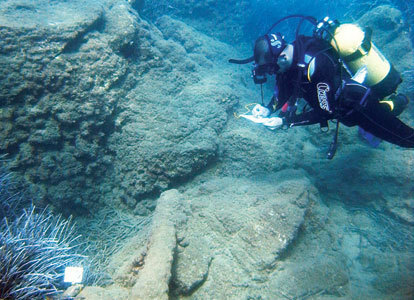 The excavations thus far have been conducted mostly by the Directorate of the Alanya Museum where much of the material evidence is now housed. The oldest ruins and inscriptions appear to date to the thirteenth century AD with the earliest dating to the eight or seventh century BC. For information on Laertes I turn to Strabo who tells us that Laertes was a fortress situated upon the crest of a hill, of a pap-like form. It is located east of Syedra and Northwest of Coracesium. The route up to the fortress is defended by two spaced towers and by a stretch of wall. Underneath the fortress is an underground building consisting of three vaulted passages which could have functioned as a storehouse. Additionally on the North side are the remains of a long paved street which would have been originally lined by statues supposedly of Roman emperors. On the south side of the street are the remains of a building approached by steps which is believed to be a council house and numerous statues. To the west are the remains of an agora bordered by a long pavement, an exedra and a large apsed building comprising of complex halls. Other remains of houses and buildings are spread throughout the area with the main necropolis on the mountain slope to the south of the city. This entry was posted in Archaeology, Musings and tagged Anatolia, Antiochis IV, Aytap, Cilicia, God, Greece, Iotape, Jesus, Julius Caesar, Mediterranean, natural fortress, Numismatics, Pompey, Roman, Roman province, Selinus, taurus mountains, travel, Turkey. Confessions of an Archaeologist: Live Free and Dig Hard! Awesome 🙂 I love the area so take lots of photos and share them. Have fun!